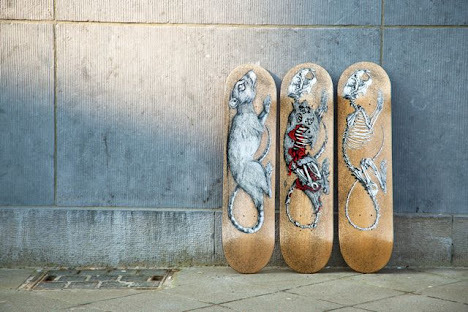 To celebrate the launch of The SK8room, the first online platform to promote fine art skateboards around the world, the site teamed up with notorious street artist ROA on 3 variations of limited edition skateboard decks that will be available from the 11th of March. Twenty percent of all sales will be donated to Skateistan, a not-for-profit that teaches empowerment through skateboarding to children in impoverished countries like Afghanistan and Cambodia. "I skateboarded as a kid. I grew up in the 80’s so skateboarding for me was one of the most important things as a teenager and it came together for me with graffiti and hip-hop culture. So it was really important and you see now it still influences me. Early Skateboard graphics of Powell and Santa Cruz had such a special meaning for me as a teenager to begin with and it is still a big part of my life. " As part of the ongoing project, ROA and The SK8room traveled to Cambodia to visit Skateistan, a global nonprofit that works with youths from various socioeconomic backgrounds to build trust and skills through skateboarding, in order to leave a lasting impression on the country through their combined passions of street art and skateboarding. Each of the 3 decks (Decay 1, 2 & 3) are printed at 150 ex. +15AP on 7 ply Canadian maple and measure 80x20cm. Each of the 3 versions are a limited edition of 125 signed in the deck boards and 25 hand signed decks. Unsigned decks cost 450€ and hand signed decks cost 950€. Every purchase includes free international shipping and 20% of sales will be donated to Skateistan. The ROA x The SK8room skate decks will be available for sale only through www.thesk8room.com beginning March 11.